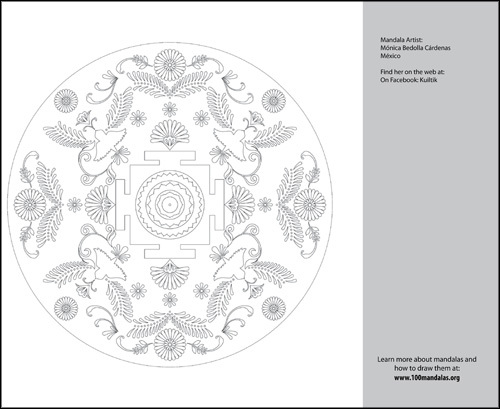 The 100 Mandalas Challenge Coloring Book is available for download. Have you noticed that adult coloring books are really popular these days? And it’s for a good reason too! Coloring is known to help reduce stress, ease anxiety, boost creativity, not to mention it’s fun! Why is it so powerful? It is a simple way to change our focus from our worries and responsibilities onto something that is beautiful. Every time I color a mandala, whether I create one myself or color another person’s design, I love seeing how the mandala comes to life before my eyes. It is so satisfying. The coloring book includes 50 mandalas from our 100 Mandalas Challenge community, like the mandala above by Jeanette Clawson from Wisconsin. Each one is unique like this one from Irina Artamonova from Russia. 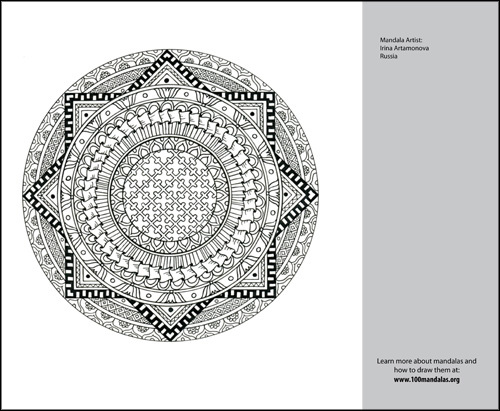 This mandala coloring page was designed by Mónica Bedolla Cárdenas from Mexico. 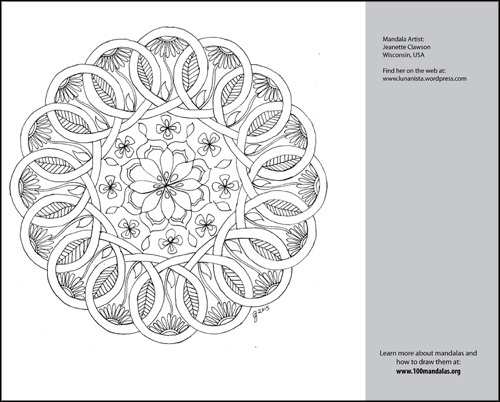 The 100 Mandalas Challenge Coloring Book has 50 mandalas for you to print and color. Download Now. Hi Gian, I think the problem may be that the e-mail you used was @email.com rather than @gmail.com. I’ve updated your e-mail address and resent the request to confirm your address. Once confirmed, you’ll receive another e-mail message with the link. Note that when you confirm, it will take you to a web page. If you click on the “return to website” link it will say that it didn’t work. It is a glitch that I’m hoping tech support will fix soon. Know that once you click on the confirm link, you are confirmed. Let me know if you have any other questions on this. Wow! Thank you SO much!! Im new to all of this but I love the Mandalas and Zentangles.